Lake Lanier Islands is a resort located on Lake Sidney Lanier in the southwest corner of Hall County, Georgia. 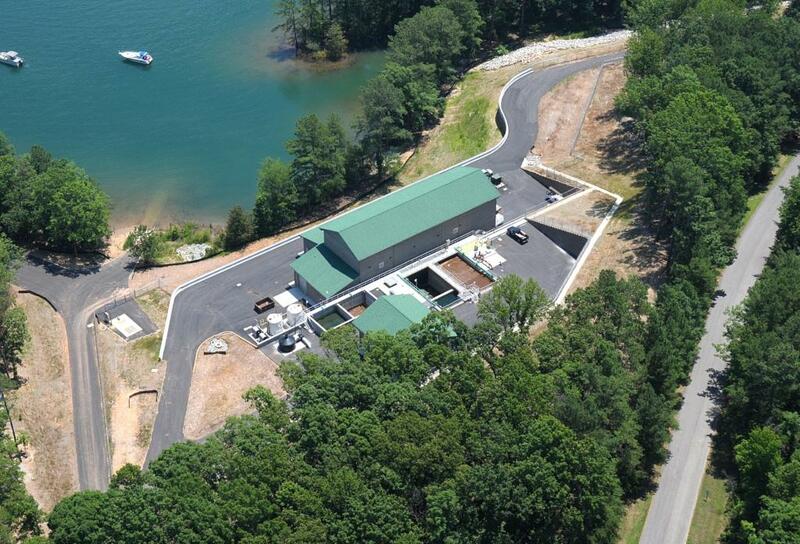 The resort had a conventional activated sludge wastewater treatment plant that was 38 years old and discharged into Lake Lanier under a National Pollution Discharge Elimination System (NPDES) permit. Upon renewal of the permit in 2007, a discharge limitation of 0.13 milligrams per liter was placed on the concentration of total phosphorous that could be discharged to the lake. Because the existing facility was not capable of treating the wastewater to this limit, it was decided by the Lake Lanier Islands Development Authority to construct a new advanced wastewater treatment facility. The technology that was selected was a membrane biological reactor (MBR) system. ESI assisted the Owner in procuring and evaluating proposals from several membrane manufacturers. The selected MBR system was the GE/Zenon hollow fiber membrane system. ESI designed the project and provided construction management, inspection and commissioning assistance services to the owner. Construction was completed in January 2010. The new Lake Lanier Islands Water Reclamation Facility is an advanced biological/chemical nutrient removal wastewater treatment plant designed to treat 0.5 million gallons per day (MGD) of flow expandable to 1 MGD. The treatment processes consists of influent equalization, influent fine screening, grit removal, the MBR process, chemical feed facilities, ultraviolet disinfection, post re-aeration, effluent pumping, aerobic digesters, solids dewatering by centrifuge, and odor control. The biological process train consists of anoxic selector tanks, aeration tanks and the membrane tanks. ESI prepared a Design Development Report (DDR) in 2014 and, later, the engineering design services for expansion of the Indian Creek Water Reclamation Facility (WRF) from 1.5 million gallons per day (MGD) to 3 MGD. The treatment plant was also converted from a land application system to a surface water discharge type treatment plant and the treatment process was changed from a contact-stabilization process to a membrane biological reactor (MBR) treatment process. 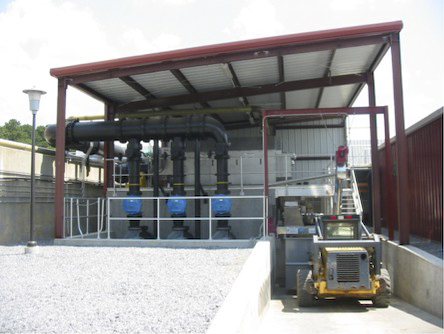 ESI designed improvements to the headworks facility for this existing municipal wastewater treatment facility that utilizes GE/ZENON membranes. Headworks improvements included adding two 1-mm screens and a pump station. The screening system for this facility was originally designed with two 2-mm band screens followed by grit removal. Rags and stringy material frequently bypassed the screens which then required increased cleaning of the membranes. Two 1-mm drum screens were added downstream of the grit removal system to re-screen the raw wastewater prior to entering the treatment process. At the conclusion of construction and upon startup, ESI and the Owner were pleased with the level of retention and removal of solids in the 1-mm screens. In early 2008, the Meriwether County Industrial Development Authority constructed an industrial park in northwest Meriwether County. 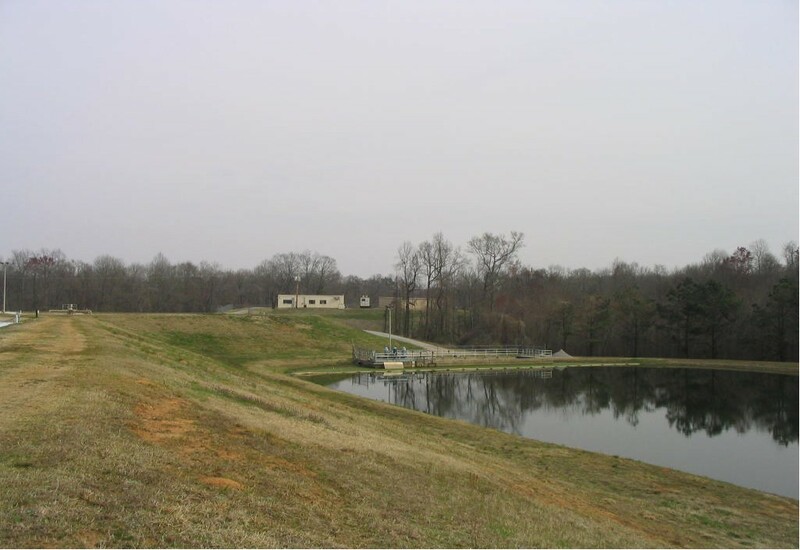 The Meriwether County Water & Sewerage Authority (MCWSA) engaged ESI to plan, design, permit, and manage the construction of the first phase of a regional wastewater system for the County. The initial phase of the system involved providing wastewater service to the industrial park and adjacent commercial properties. The collection system and interim on-site wastewater treatment system were fast-tracked so wastewater service would be available to the initial South Korean and German companies that located in the park. For the permanent treatment facility, the goal of MCWSA was to utilize treated effluent for irrigation and potential cooling water use within the industrial park and to provide water for dust control at a nearby landfill. MCWSA requested specific treatment levels above what would typically be required for reuse-quality water. ESI evaluated several different treatment alternatives to identify the best treatment process train to achieve the desired effluent quality. These alternatives included advanced BNR treatment followed by deep-bed sand filtration; an MBR process; and an SBR process followed by cloth media filtration and membrane filtration. For this project, ESI recommended the SBR process followed by filtration with cloth media and polishing with pressure membranes as the best overall option. It was determined that this process train provided the most operational flexibility, multiple treatment barriers, proven reliability, and the lowest life cycle cost. 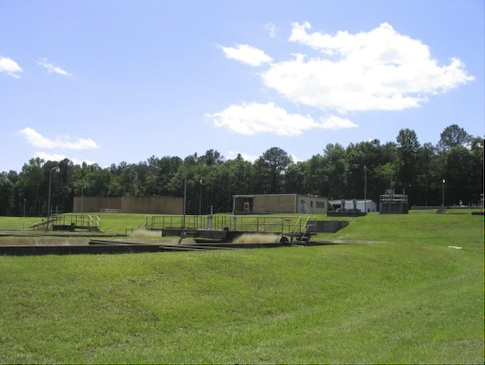 ESI has designed the Meriwether County Water Reclamation Facility for an initial capacity of 0.25 MGD with a planned layout that will accommodate future expansion to 2.0 MGD. The treatment train consists of influent fine screening, grit removal, the SBR process, flow equalization, cloth media filtration, membrane filtration, chemical feed facilities, hypochlorite disinfection, aerobic digesters, rotary press solids dewatering, and odor control. ESI has been responsible for all design and permitting of the wastewater system including the gravity sewer collection system, pump stations and Water Reclamation Facility. Construction of the collection system and interim on-site wastewater management system were completed in 2009. The Water Reclamation Facility is expected to be constructed in 2012. The City of Griffin owns and operates the Potato Creek Wastewater Treatment Plant. The plant currently has a permitted capacity of 2.0 MGD. Growth in the facility’s drainage basin requires the plant capacity to be expanded. The new discharge limits for the expanded plant significantly reduce the concentration of nitrogen and phosphorus allowed in the effluent. The existing treatment processes that consist of trickling filters followed by oxidation ditches are not capable of meeting the new effluent limits. ESI evaluated different treatment and expansion options capable of providing the level of treatment required. The evaluation of the alternatives along with coordination with the wishes of the City’s operations personnel resulted in the selection of an advanced BNR oxidation ditch process. The goal was to design and construct a facility to maximize the removal of nutrients biologically and minimize chemical treatment for phosphorus removal. ESI prepared the required Antidegradation Review, which is required for all direct discharges in Georgia, the Environmental Information Document, the Design Development Report, and the NPDES permit application, to allow the extended permitting process to begin while the plans and specifications for construction were being prepared. The main biological process included an anoxic selector basin, anaerobic basins, oxidation ditch, followed by anaerobic basins and a reaeration basin. The process was designed with multiple trains to provide EPA Class 1 reliability. Support facilities included, mechanical fine screening, grit removal, lime feed for alkalinity adjustment, alum feed for phosphorus removal, flocculating clarifiers, a new RAS/WAS pump station, ultraviolet radiation disinfection, post-aeration, and an Autothermal Thermophilic Aerobic Digestion (ATAD) process for meeting Class A sludge requirements. Provisions were also made to allow for the future addition of filters to allow the facility to meet potentially lower future permit limits. ESI has completed the design of the facility and the plans and specifications have been approved by the Georgia EPD. Construction of the facility is expected to begin in 2012. The City of Griffin owns and operates the Shoal Creek Wastewater Treatment Plant. 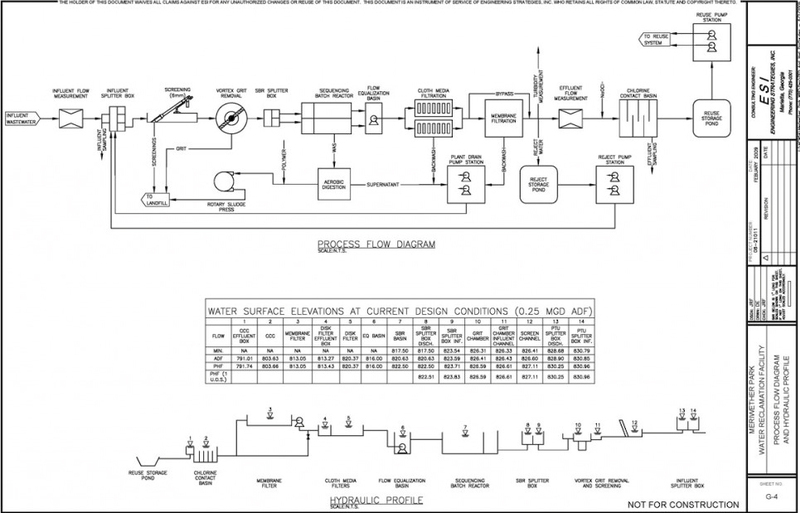 The plant currently has a permitted capacity of 2.25 MGD, with effluent disposal on a dedicated land application site. Growth in the facility’s drainage basin requires the plant to be expanded. Due to the high cost of land in the area of the existing facility, it is not cost-effective to expand the land application system. Therefore, the City obtained a wasteload allocation for discharge to Shoal Creek with the goal of continuing to use the existing land application system and constructing an advanced treatment facility for flows above the current capacity of 2.25 MGD. This resulted in the need for addition of a new 1.25 MGD advanced treatment facility expandable to 2.5 MGD. ESI worked closely with the City to select the new treatment process. Ultimately, an SBR process was selected due to its ease of operation, BNR capabilities, and proven reliability. A new preliminary treatment unit was designed to handle all of the incoming flow, which included mechanical fine screening and grit removal. Following preliminary treatment, the flow was split to two separate pump stations to transfer the wastewater to each treatment system, the existing LAS system and the new direct discharge system. The new direct discharge system included the SBR system, chemical feed facilities, ultraviolet light disinfection, post aeration, aerobic sludge digestion for meeting Class B sludge requirements, and liquid land application of digested sludge. Provisions were included in the design to allow for the future addition of flow equalization and filtration to meet anticipated stricter discharge limits into Shoal Creek when the new plant is expanded to 2.5 MGD. ESI has completed the design of the facility. It is anticipated the new facility will begin construction in 2013. ESI has extensive experience in planning, permitting, design, construction management and startup of wastewater treatment facilities for municipal and private clients. In the past four years, ESI has designed new, expansions, or upgrades to seven (7) advanced wastewater treatment facilities in Georgia, three of which utilize membrane technology as the primary treatment process and a fourth that uses membrane filtration for final effluent polishing. We have designed several BNR treatment processes to assist clients whose discharge permit limits for nitrogen and phosphorus were reduced by Georgia EPD. By maximizing the use of biological nutrient removal processes, our clients can save considerably in operating costs by minimizing chemical usage for removal of nutrients and in the accompanying increase in solids production. On several of the facilities we have designed, the treated effluent will be used for irrigation on nearby golf courses, by industrial facilities for cooling water, and various other non-potable uses. Upon selection of the MBR manufacturer, we work directly with the manufacturer’s engineers during detailed design to ensure all of the necessary provisions are included for proper operation of the facility. Our evaluation process has shown results. Our clients have saved millions of dollars on their projects by utilizing the treatment processes that best match the characteristics of their plants with the level of treatment required to meet the prescribed discharge limits with the optimum level of reliability.